Just like it happened to us, I am sure you are probably wondering why dry boxes for cameras are useful. Are they worth it, or it is just a marketing trick companies are using to sell products. Well, I guess it all comes down to your needs. Are you shooting professionally? Do you often shoot in high temperatures and high humidity environments? If you are, then you should look at a humidity controlled storage cabinet for cameras. 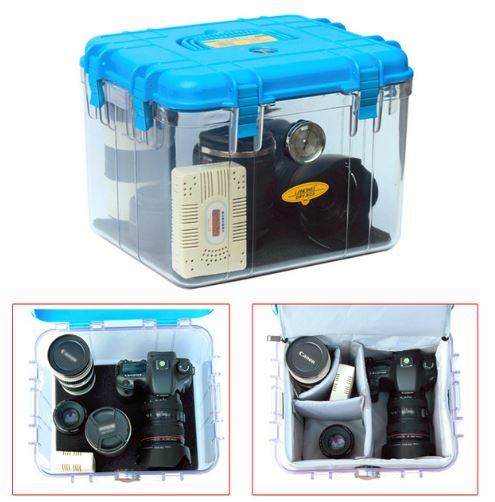 Dry Boxes for Cameras are cases that keep your DSLR and lenses safe from humidity and dust. These, in turn, are environments where mold and fungus will “attack” your gear, and sometimes this could mean the end for expensive equipment. You could call it a dehumidifier for camera and lenses, but it is a little bit more than that. We plan on providing all the information you need to know about DSLR and camera lens storage cabinets in this article. There are many reasons why these cases are of significant importance and we will go over them right now. First of all, humidity is the biggest enemy of electronics. Combine it with dust and are the best place for mold and fungus to develop. These are the biggest enemies of cameras and optical lenses. Better to prevent this from happening, than to make the effort of cleaning them. While cleaning cameras or lenses from fungus and mold is possible, it can be a difficult task. Not to mention the fact that in the process you could severely damage expensive gear. Because camera gear is expensive, it’s worth it to invest in protection solutions for them. A dry box might seem like an expensive proposition, but you can get some for under 100 dollars. This is not much compared to how much it costs to replace gear. 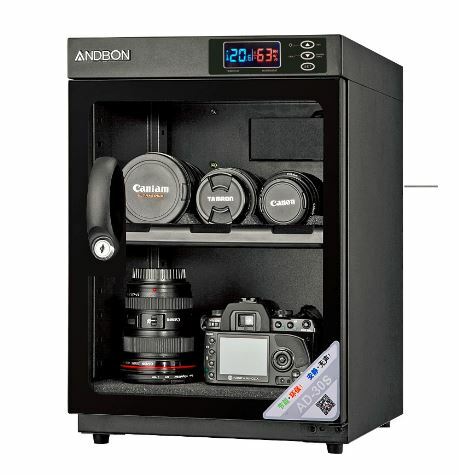 This cabinet for DSLR is a storage system fitted with electronic control for easy operation. Usually, they come fitted with hinged doors, to allow for easy open and access to electronic gear. We have seen cabinets with shelving features and also prebuilt spaces for storage. This means specifically built spaces for lenses, cameras or other accessories you want to fit. Just make sure before you buy that your accessories fit those slots. A camera storage cabinet will come in different sizes. Plan in advance and think about how big it should be. Consider how many camera and lenses you have, and also if you will expand. Maybe buy a bigger one than you need require, just to be on the safe side. A good storage box for cameras & lenses should meet the technical requirements of the industry. If you are investing the money, you should be getting the appropriate product. The relative humidity accuracy of a dry box for cameras should be around +-3% RH. Tighter accuracy is good but keeps it around 3% and you should be fine. Silent operation is another aspect. You don’t want a noisy thing next to you all the time. If it’s silent enough and you are tight on space, you should be able to even keep it in your bedroom. Desiccators are a cheaper alternative to electronic storage systems. While they don’t look that fancy as electronic ones, they do deliver on their promise. They are also smaller in size and can be easily carried around. We think they will be an ideal choice if you don’t have storage space at home or you just don’t want to invest that much. These dry boxes have dehumidifying features just like electronic ones. It might not seem as precise as the electronic ones but they do a good job. The box is airtight and will protect from mold, humidity and even shocks when you carry it around. A hygrometer comes installed in the box and this allows for easy monitoring of the relative humidity. It is also quite precise. They come in different sizes, depending on your needs. We have seen volumes ranging from 9l to 23l. To make sure you can carry them easily, they are fitted with shoulder belts that can be adjusted as required. The silica gel used to dehumidify is user replaceable. They also last quite a long time, because generally, the items you put in won’t carry high humidity. Besides buying, another alternative is a DIY dry case for cameras. This is a project that you can definitely make at home but it requires technical knowledge. Reverse engineer the commercial product that does what you need. See what such a special box offers, and plan your own version. You will need to pay attention to some factors. You will need an initial storage box. A plastic one will be the easiest to find and the probably the cheapest solution. It has to have good sealing capabilities so check those that have removable lids with high-quality seals. The next step will be to have a dehumidifying solution for the box. Silica gel bags are an option and probably the most affordable one. More expensive electronic dehumidifiers are another. Last but not least, you will need something to monitor the relative humidity in the box. There are different solutions available on the market from analog to digital ones, depending on precision and how much you want to invest. Evaluate how much it will cost you in the end. Some market products are cheap enough to just buy and forget about building your own. As we’ve learned through this article, there are many advantages for using dry boxes for cameras. While they might be a costly investment, they will protect your expensive camera gear, so the investment is well worth it.